My intention this year was to increase my focus on Championing Girls’ Opportunities in Engineering, while still keeping up connections with the broader STEM and Education communities. However, the portfolio nature of work like mine means that things don’t always go entirely as planned. So when it came to reviewing the year, I’m actually really pleased how 2015 has turned out. I’ve been invited to become a Fellow of the Women’s Engineering Society. I’ve been a member for many years, and the fellowship really cements my relationship with this increasingly influential organisation. 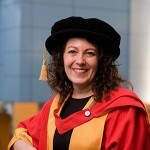 I’ve also been awarded an Honorary Doctorate by the University of Bradford. I have received other ‘hon docs’ over the years, but this one is especially close to my heart being in Engineering and from a Yorkshire University! I’ve developed two targeted presentations during the year; one aimed at schools (particularly years 9 – 11) and another to businesses. There’s more about these in my blog ‘Looking forward to 2016’. I’ve delivered these to various schools and as keynote presentations and lectures around the country during the year. Chairing events such as the Tata Innovation Forum and the Association of University Engineers Conference have helped me keep in touch with new developments and challenges. It’s always a compliment to be taken as ‘one of us’ by delegates at such events – where I can’t claim expertise, I certainly have interest and I find that serious homework beforehand helps me feel at home and be better placed to respond to the needs of those attending. I have enjoyed an increasing number of events for girls and women – the Women’s Engineering Society Conference, the WISE Conference and Awards, a Women in Technology event at the RI, the launch of the latest ‘Women in Manufacturing’ report and a fascinating event hosted by National Grid for undergraduate females considering going into engineering. The reason that the last one was so interesting is that I had previously considered this to be the least of our problems – if girls had chosen to study engineering, then they had already made their career choice. It turns out that this is a highly potential leakspot in the pipeline, so it was educational for me to take part as well as sharing my knowledge and enthusiasm to these young women. The new President of the IET is Naomi Climer who joined the BBC on the same day as me in 1987 in our first engineering roles. As well as the two of us, there were five men on our initial training course and while it is wonderful to welcome Naomi as the first female president of the IET, it is also alarming to note that the percentage of women joining engineering schemes such as ours has probably decreased since those days. I was genuinely thrilled to be at her Naomi’s president’s lecture in November (I am so proud of what she has achieved), and had the unexpected treat of meeting up with the lead lecturers on our first engineering training course at BBC Wood Norton near Evesham. 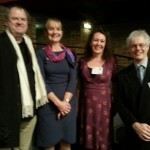 The only photo I got with Richard Schiller, Naomi Climer, me and Nigel Ward is rather blurred, but it still a valued momento of the occasion. Finally, I should mention some of the amazing prestigious events I’ve had the opportunity to be part of, from the Queen Elizabeth Prize for Engineering live-streaming to hosting the black-tie Structural Engineering Awards at The Brewery in London. One of the most challenging is chairing the celebrity judging panel for the National Science and Engineering Competition ‘Young Engineer of the Year’ award. We are aware that we are conferring a life-changing experience on the young person who receives the accolade, and it will be no surprise that the panellists are not always in agreement about who should receive the award. The organisers cleverly put the decision just before lunch, with the threat that we will miss out if we don’t come up with our final winner. Now that my children are in year 11 and year 13, heading for GCSEs and A levels, I’ve had the excuse to visit various universities as a parent, and frequently found myself wishing I could go back and be a student again. 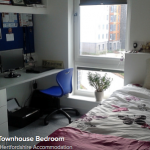 However, I did find it hard to concentrate on the accommodation tour of the University of Hertfordshire when we were taken round Bellingham Court which has been occupied for over a year now, but had its official opening in May. My daughter kept sniggering every time they said the name of the block. The last thing to mention is that I am still engaging in lifelong learning – carrying on developing my knowledge and skill not just in STEM but in other areas of my life. I attended the Sherborne Summer School of Music in August as a vocal soloist and I boldly stepped outside my comfort zone by singing solo roles in Bizet’s ‘Carmen’ with Harrow Opera and Sondheim’s ‘Into the Woods’ with the Hemel Hempstead Theatre Company, as well as taking part in productions of Britten’s ‘Albert Herring’ and Jason Robert Brown’s ‘Parade’. And I also fulfilled a very long held ambition – I have finally taught myself to crochet.